This pizza overall for a quick and easy meal or snack for the kids is rather tasty. I wouldn’t call it a supreme pizza as the toppings are a little sparse and a little lacking in flavour. I certainly wouldn’t say this is a favourite frozen pizza in my family but I still would purchase it if I couldn’t find my actual favourite. When in a hurry i will fall back to this brand. Very easy for older children to cook themselves in small oven. The supreme sometimes needs extra cheese on it but not too bad at all for a pre Prepared pizza. We do not do takeaway in my household so this is a great alternative for takeaway night. However can be abit pricy with a big household we wait til on sale then freeze them. This supreme pizza is quite yummy and filling but it’s not always a cheap price for it’s quality. Still an average pizza from an average company. I don’t mind Mccain’s supreme pizza but the crust really does let it down. I have only bought this pizza on a couple of occasions but there are other pizzas that I prefer. Pizza that is frozen and easy to cook is popular in our household for some lazy weekend nights. 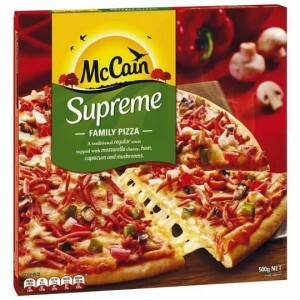 This Supreme pizza by Mccain has good and tasty toppings and top flavour. I get McCain Supreme pizzas for my kids every now and then. My kids love it but I find it very light on with the toppings and not a lot of flavour in it. How would you rate Mccain Supreme Pizza?